Bob Oates reviewed the issue with plumbing and syringes with King 5 News. Syringes and needles have been causing plumbing problems around Seattle. Bob Oates Sewer & Rooter has seen an increase of needles in toilets and pipes over the last past years. “It never fails to amaze me where we find them. Usually they’re in certain neighborhoods, Capitol Hill, ten years ago Belltown. Every place from Starbucks to restaurants.” Bob Oates tells King 5. It’s not only in toilets either. We find them in urinals and sinks too. It is so serious that business’s on Broadway are no longer letting the public use their bathrooms in fear of having them be littered in drug paraphernalia. Other businesses are installing needle disposal boxes in their public restrooms to help promote safe disposal, and so far they have been working pretty well. Plumbers believe the increase of needles is cause by the clean needle exchange program in Seattle. 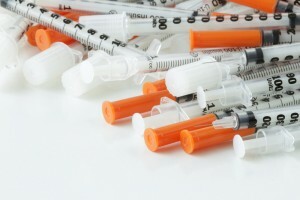 The syringes are not only horrible for pipes but also bad for the environment. Also found in the pipes are burnt spoons and cans. Our Technicians at Bob Oates know how dangerous it is to remove needles so we take serious precautions to dispose of it safely. We wear leather gloves over latex gloves & pick it up correctly. To learn more on how to pick up syringes safely and correctly check out this video and to learn more about this story go here.